SOA stands for Service-Oriented Architecture (as you probably know by now 😉 ). But, WTH is a service? OK, but what does it mean in terms of real-world services? It means that you should design your services to be as granular as possible to promote composability and reusability. It also means that these services should be stateless (i.e., they should not assume that the server is in a state a previous request set it on); these services should be autonomous (i.e., they should not depend on other services to perform it’s actual task – unless, of course, we are talking about a composition); they should be discoverable (i.e., you should have some kind of directory where you can find the service that performs the task you are looking for); they should be loose coupled to each other; and last but not least, they should have a contract you can rely on – one that is standardized such as your clients will not have trouble when using your service. Note that, so far, no one has talked about WS-* or REST. That’s because SOA is not defined in terms of technology, or tools, or whatever. SOA is based on a set of good practices, in order to ensure ROI (Return of Investment). BTW, of course SOA is not that cheap (studies prove that a brand new implementation of SOA is 30% more expensive in the initial phases, but they pay off over time). But, getting back to technology… nor WS-* nor REST define SOA. You can have lots of WS-* Web Services on your architecture, or lots of REST services on your architecture, but still have no SOA. Again: SOA is based on practices, not technology. Of course, enterprises over the world have developed tools to help achieve the goals (some of them don’t even give so much help ;)), but the tools are not the end – they are the means. If you define your architecture such as enough business logic is exposed as services (again, no one is talking about technology here), then you will have SOA. Buuuut… here comes the little lines at the bottom. Why my company always talk about technology and vendors when it comes to SOA? The truth is that it can be very hard to promote SOA within the terms mentioned above (or, at least, to do so without tools). That’s why companies almost always have SOA with WS-* and tooling. It’s really hard to have directories of services without any kind of tools, and it’s very hard to promote service discovery without WSDL’s (OK, REST has got WADL, but it hasn’t got to a level where every REST service has one. Actually, REST doesn’t need WADL, and that’s not the case with WS-* services). Also, even that your company decides to make its own tooling to promote these practices, it can be very hard as well to comply with non-functional requirements, such as performance, monitorability, scalability, etc. Remember that these services are granular, and that the traffic over network is XML/JSON. Imagine lots of services doing marshalling / unmarshalling of these data everywhere. So, the first tool that came around to solve these problems is the ESB. ESB stands for Enterprise Service Bus. As the name says, it is nothing but a bus to your services. But, wait… a bus that takes what to what? The responsability of an ESB is to map requests from a client (usually, these clients see a service, with a contract and everything else) to… somewhere. Really, the ESB may lead to a WS-*, a REST service, the file system, BPEL (I’ll talk about this one later), JMS, and lots of other protocols. Actually, it should be able to transform any protocol to any protocol. But, of course, this very core of an ESB may lead to accomplish several other purposes. Take monitorability, for example: if an ESB will map these protocols, and data will pass through it, it may take metrics over it, and map response times, success rate, failure rates, fire alerts when these metrics reach a given threshold, and so on. Also, it may guarantee security to these services (by exposing only the ESB for clients, and inserting some assertions to routings), as well as several other things. Also, an ESB may promote security by an application level. They usually have a feature known as throttling, which prevents a client from sending too much data (so much it can cause service failure). Of course, these kind of stuff should be ensured within XML Schemas, but they know detailed schemas are hard to maintain inside an ecosystem of dozens, hundreds or even thousands of web services. keeping the flow visual, i.e., to ease the development and/or auditing. As you may have realized, BPEL is specialized in keeping state of stuff. I know, web services should be stateless, and BPEL is – from the point of view of the client. But it keeps the state of the compositions for more pragmatic stuff like the mentioned above. It is conceptually different from an ESB as ESB’s should not keep the state of the requests, anywhere. So, how to organize these together? As an ESB does every kind of transformation, protocol A -> protocol B (doesn’t mean, of course, that A is different from B), it is fair to place all data traffic over it, just to place metrics, alerts, throttling, and everything else, onto it. 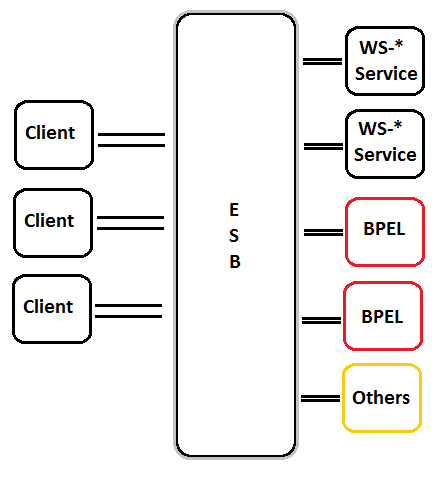 BPEL, WS-* services, REST services, and so on, will be accessible through it, and BPEL will not see directly the other services, but will reference the services that are already placed inside the ESB. Of course this architecture has a huge drawback: too much overhead inside one piece. The ESB, here, must be intensively took care of (I hope your company has some baby sitters! =D). It means that maybe a few network cards, some gigabytes of RAM, and clustered to some four, five nodes. But believe me, depending on the number of services your company has (maybe the very size of the company), it totally pays off. Of course, maybe does not make sense if you have only a few services, but I’m talking here of a few hundreds (or thousands) of services. Architectures don’t come inside a box. You need to be very very extra judiciously to analyze whether you need to place these kind of stuff in your company. Perhaps you don’t really need BPEL. Perhaps you don’t really need an ESB at all. Perhaps you need it but you can’t afford it. Perhaps it makes more sense having REST services than WS-* and these bunch of stuff. Every single aspect of SOA comes with positives and negatives. What you need to do is to analyze these points and carefully think if you really need the positives and if you can handle the negatives. When: When you need Spring to manage Jersey´s libraries, but still want to be free to develop your services using JAX-RS. When not: If your team does not know REST, maybe it´s not a good idea to use it in development, because REST has its own culture – Uniform Interfaces, Hypermedia, the concept of Resource-Oriented, etc. Validation code, that is valid for all subclasses.